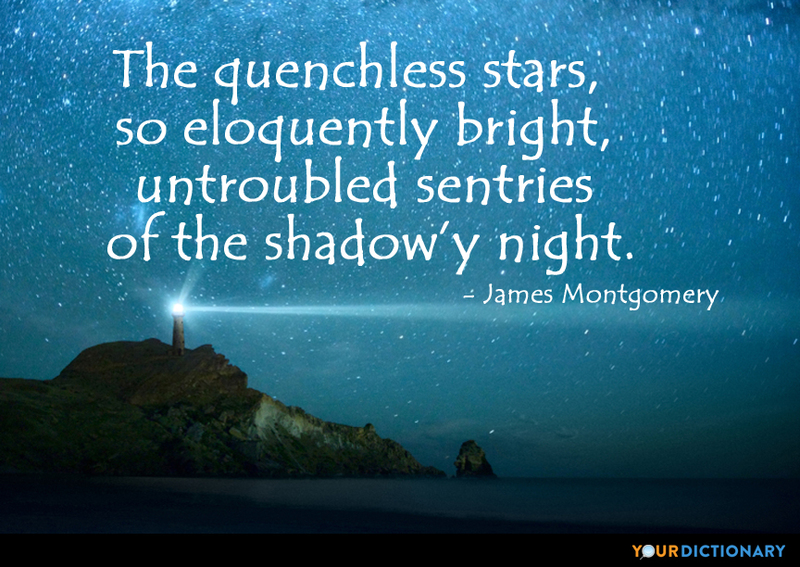 James Montgomery (November 4, 1771 – April 30, 1854) was a British editor and poet.  The Ocean, Line 54. Once, in the flight of ages past,There lived a man. Counts his sure gains, and hurries back for more.  The West Indies, Part iii. 'T is not the whole of life to live,Nor all of death to die. Who that hath ever beenCould bear to be no more?Yet who would tread again the sceneHe trod through life before? Here in the body pent,Absent from Him I roam,Yet nightly pitch my moving tentA day's march nearer home.  At Home in Heaven. If God hath made this world so fair,Where sin and death abound,How beautiful beyond compareWill paradise be found!  The Earth full of God's Goodness. Baptize the nations! far and nigh,The triumphs of the cross recordThe name of Jesus glorify,Till every people call Him Lord.  Reported in Josiah Hotchkiss Gilbert, Dictionary of Burning Words of Brilliant Writers (1895), p. 322. As a poet Montgomery stands well to the front. His poetic genius was of a high order.  John Julian, Dictionary of Hymnolgy. J Murray ISBN 978-0719507212. Prayer moves the arm Which moves the world, And brings salvation down.  James Montgomery, The Little Cloud. There is a flower, a little flower With silver crest and golden eye, That welcomes every changing hour, And weathers every sky.  James Montgomery, A Field Flower.  James Montgomery, The Adventures of a Star.  James Montgomery, The Ocean, Stanza 6. There is a world above, Where parting is unknown; A whole eternity of love, Form'd for the good alone; And faith beholds the dying here Translated to that happier sphere.